Explore die cut composition cork & an array of cork-n-rubber materials for consumer products with the consumer manufacturing team at Frank Lowe. Since 1955, Frank Lowe has been helping arts & crafts manufacturers with our selection of die cut cork. 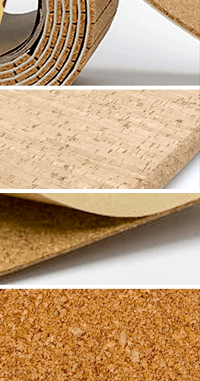 To ensure we meet your needs, we offer both cork composition and cork-n-rubber solutions. In either case, our experts will first work to understand your specific application. Then, we'll guide you to the most appropriate cork material for your unique product. Another cork solution for consumer products are cork-n-rubber materials made out of synthetic rubber polymers and quality granulated cork. The rubber elastomer is added to lend desirable characteristics, such as the ability to resist acid, fungus, and weather conditions. The rubber also allows the material to be able to seal. Our experts will help you choose the optimum blend of cork-n-rubber with the right density based on your specific consumer product. We'll guide you through the process, helping ensure the finished product can last for several years to come in your application. At Frank Lowe, we provide an invaluable service to help our clients create better products in the most efficient manner. Depending on the specifics of your application, we'll guide you toward either our cork composition or our cork-n-rubber die cut solutions. Explore all of the possible die cut solutions with both cork composition and cork-n-rubber. Pursue the feasibility of each potential solution with cost-benefit analysis. Create the perfect die cut cork component for your application while remaining within your budget. Let's talk. We're ready to listen. Contact Frank Lowe today for die cut cork composition and die cut cork-n-rubber products for consumer applications.